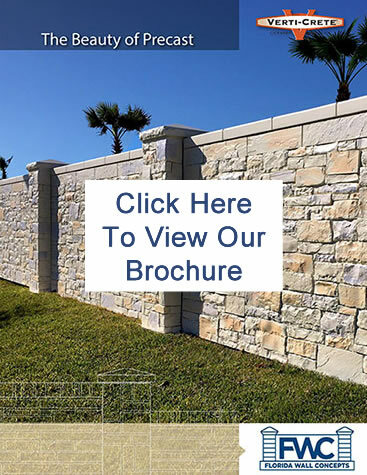 Florida Wall Concepts gives residential and commercial property owners in the Central Florida area a cost effective way to have the timeless look of true stone masonry construction and landscape design. We pride ourselves with distinctive, elegant walls with a rich visual impact, the highest quality and ability to meet the challenges of Florida’s harsh climate at a fraction of the cost. Verti-Crete is a precast concrete walls and columns system that have the authentic rock look, perfect for privacy fencing and commercial sound walls. Not only beautiful, they are easy to install, require less manpower and equipment, while retaining the natural stone work quality with a weather and UV resistant finish. Today’s technology has made it possible to create a grand entrance or give your property a facelift at a tremendous savings. Verti-Crete’s proprietary vertical mold and form system achieves a flawless and realistic stone pattern on both sides of the wall and four sides of the column. A seamless solid panel design provides security and structural strength with textures and styles that compliment the environment and last for decades. You can feel confident Florida Wall Concepts will deliver a quality product at a price you can afford. We personally work with each client, ensuring every project goes smoothly. Florida Wall Concepts, innovative wall solutions at prices you can afford. Ledgestone: Organic, rustic appearance of tailored stacked stone with serrated edges. Durango: Natural looking marble limestone and travertine dimensional stone. Stucco: Architectural elements that resemble inlays in marble and semi-precious stones. Cobblestone: Elegant, rich visual impact of natural cobblestone with intriguing textures. © 2015 Florida Wall Concepts Inc.